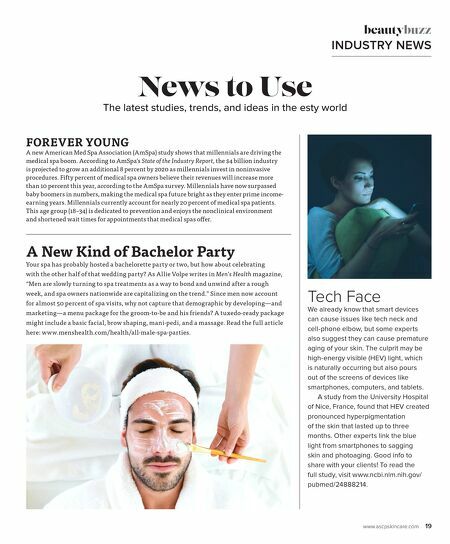 www.ascpskincare.com 19 beautybuzz INDUSTRY NEWS News to Use The latest studies, trends, and ideas in the esty world A New Kind of Bachelor Party Your spa has probably hosted a bachelorette party or two, but how about celebrating with the other half of that wedding party? As Allie Volpe writes in Men's Health magazine, "Men are slowly turning to spa treatments as a way to bond and unwind after a rough week, and spa owners nationwide are capitalizing on the trend." Since men now account for almost 50 percent of spa visits, why not capture that demographic by developing—and marketing—a menu package for the groom-to-be and his friends? A tuxedo-ready package might include a basic facial, brow shaping, mani-pedi, and a massage. Read the full article here: www.menshealth.com/health/all-male-spa-parties. Tech Face We already know that smart devices can cause issues like tech neck and cell-phone elbow, but some experts also suggest they can cause premature aging of your skin. The culprit may be high-energy visible (HEV) light, which is naturally occurring but also pours out of the screens of devices like smartphones, computers, and tablets. A study from the University Hospital of Nice, France, found that HEV created pronounced hyperpigmentation of the skin that lasted up to three months. Other experts link the blue light from smartphones to sagging skin and photoaging. Good info to share with your clients! To read the full study, visit www.ncbi.nlm.nih.gov/ pubmed/24888214. FOREVER YOUNG A new American Med Spa Association (AmSpa) study shows that millennials are driving the medical spa boom. According to AmSpa's State of the Industry Report, the $4 billion industry is projected to grow an additional 8 percent by 2020 as millennials invest in noninvasive procedures. Fifty percent of medical spa owners believe their revenues will increase more than 10 percent this year, according to the AmSpa survey. Millennials have now surpassed baby boomers in numbers, making the medical spa future bright as they enter prime income- earning years. 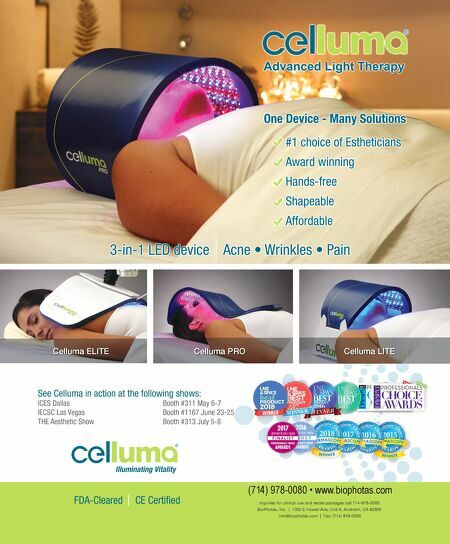 Millennials currently account for nearly 20 percent of medical spa patients. This age group (18–34) is dedicated to prevention and enjoys the nonclinical environment and shortened wait times for appointments that medical spas offer.